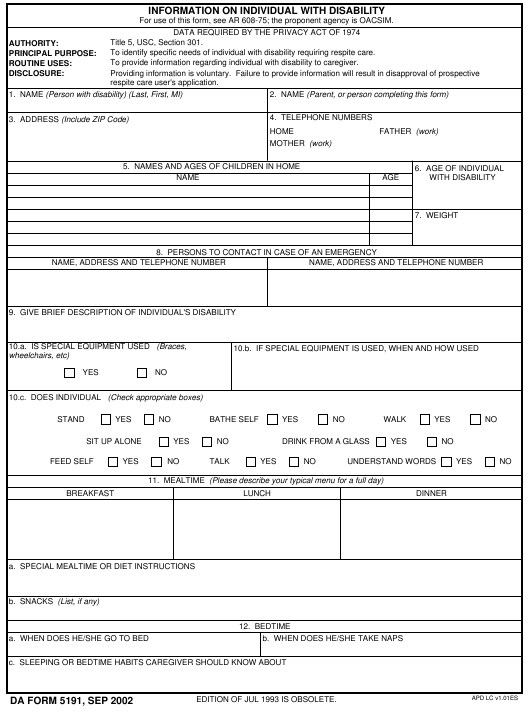 DA Form 5191 or the "Information On Individual With Disability" is a Department of the Army-issued form used by and within the United States Military. The form - often incorrectly referred to as the DD form 5191 - was last revised on September 1, 2002. Download an up-to-date fillable DA Form 5191 down below in PDF-format or look it up on the Army Publishing Directorate website. Title 5, USC, Section 301. To identify specific needs of individual with disability requiring respite care. To provide information regarding individual with disability to caregiver. EDITION OF JUL 1993 IS OBSOLETE. d. WHAT DO YOU DO WHEN SEIZURES OCCUR? the permission form each time a new caregiver is in charge. responsible or liable in any way for any accident or illness that may occur.